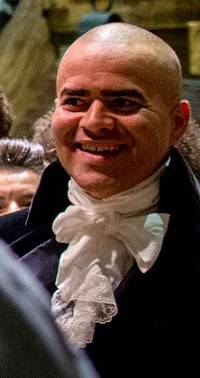 Christopher Jackson (born September 30, 1975) is an American actor, singer, musician, and composer best known for his roles in Broadway theatre. Specifically, Jackson is known for starring alongside Lin-Manuel Miranda in the Miranda's original productions of In The Heights in 2008 and Hamilton in 2015, the latter of which earned Jackson a Tony Award for Best Featured Actor in a Musical nomination for his role as George Washington. • Emmys: Who is presenting and competing in Sunday's Emmys ceremony? This webpage uses material from the Wikipedia article "Christopher_Jackson_%28actor%29" and is licensed under the GNU Free Documentation License. Reality TV World is not responsible for any errors or omissions the Wikipedia article may contain.